Training is perhaps the most important part of purchasing a Kwik Kerb system. All Kwik Kerb business owners are provided with a full five day comprehensive training course which has been developed and proven successful for over 25 years. The course will ensure that you are ready to lay professional quality kerbing which meets the high standards your customers will expect when you operate under the Kwik Kerb brand name. Your success is our success! Introducing you to the Kwik Kerb® Business. 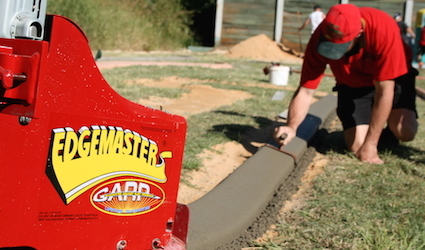 Learn to use and maintain the Edgemaster® (concrete edging machine) and other kerbing equipment. Continue kerbing methods and learn patented EuroStyle® finishing techniques. Continue kerbing methods and learn patented EuroBrick® finishing techniques. In the classroom learning proven marketing techniques. Hands-on operation of all machinery including actually laying a variety of different shaped edges for both residential garden edging and commercial kerbing. Applying the unique range of patented Kwik Kerb finishes to the edging you have laid. Service and maintenance of tools and concrete machinery. Best practice quoting, marketing and advertising techniques. How to build and maintain a strong referral network. Professional presentation and customer service skills. At Kwik Kerb we think it is better to teach you to be totally independent and self-reliant rather than have to depend on someone else. With the Kwik Kerb® business opportunity you are actually buying a business that you can grow and develop; not just a job you have to work. Visit our Compare Kwik Kerb page to see the difference. Fill out the Contact Form to speak with one of our Business Managers to find out how the Kwik Kerb® business opportunity can provide you with the work life balance you are seeking.